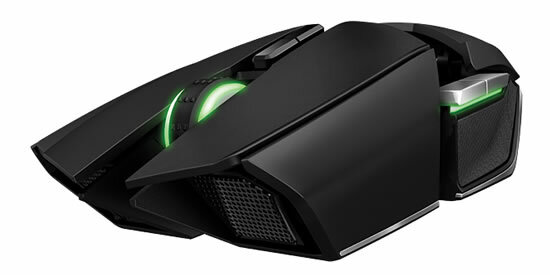 Razer today announced the release of the Razer Ouroboros. Like its namesake, the elite gaming mouse can evolve without limit, with fully-customizable ergonomics that are adjustable for any hand size and grip style. No two people have the same sized hands, and everyone grips his or her mouse differently. When researching form factor preferences for ambidextrous mice, Razer’s team of ergonomic scientists and engineers discovered three key factors in design: the length of the mouse, the back arch and the grip profile. With this in mind, the Razer Ouroboros is designed for precision gaming, with an adjustable palm rest capable of moving up to 0.9 in. (20 mm), suitable for people of varying hand sizes. The Ouroboros additionally boasts two interchangeable side panels for altering the footprint of the mouse to suit claw, palm or hybrid grip styles, and it has an adjustable back tilt angle to ensure palm support for gaming comfort and endurance. Its enhanced sensor technology is capable of up to 8200 dpi, and a dedicated, built-in dpi clutch trigger button ensures players can achieve pinpoint precision when needed. 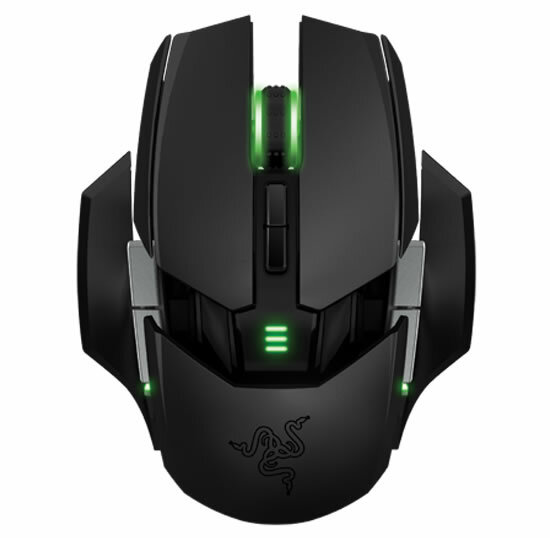 Powered by a single rechargeable AA battery, the Razer Ouroboros ensures a minimum of 12 hrs. of drag-free, lag-less play. 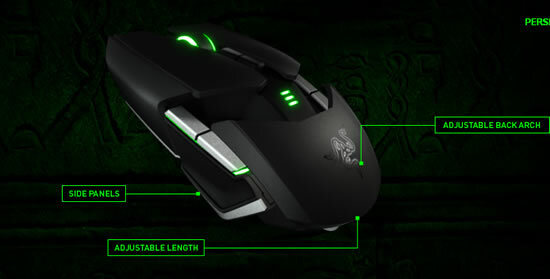 Razer’s highly advanced 8200 dpi 4G Dual Sensor System powers the mouse. 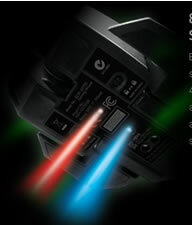 This gaming-grade mouse sensor combines a laser and an optical sensor to enhance tracking precision and detect surfaces 10 times faster than previous generation sensors. Its all-new dpi clutch lets you temporarily reduce or increase the dpi as you game, so you can go from high-sensitivity assault to more measured sniper, then back to assault again, as needed. The Razer Ouroboros ambidextrous wireless gaming mouse is designed for both right- and left-handed gamers. It offers fully customizable ergonomics and a fit for every hand size—big or small—by allowing adjustment of the arched palm rest and back. Two interchangeable side panels ensure you’re using your preferred grip style at all times. Game for hours-on-end while minimizing fatigue and maximizing comfort. 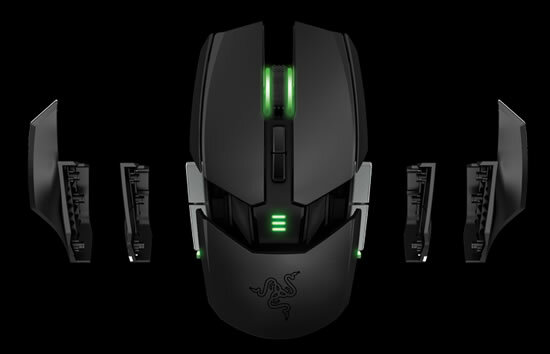 The Razer Ouroboros also features an ultra-low 1 ms latency wireless play that is as responsive and precise as when it is corded. You’re as free to swipe and destroy as your play style dictates. 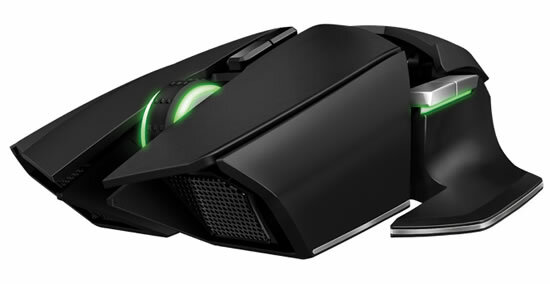 The Razer Ouroboros will be available for $129.